This concept of home is essential for understanding the growing interest in transitional modern design. While a strict prescription is difficult to pin down, the style is a distinct mix of traditional design with modern attitude. 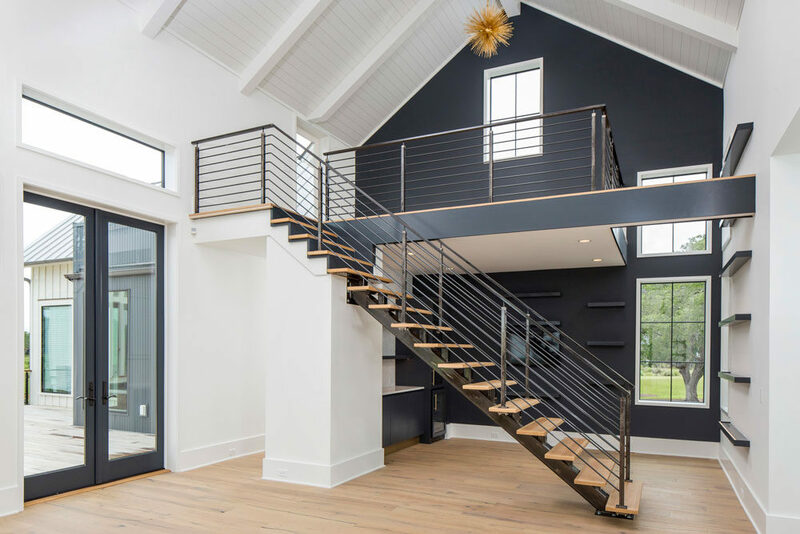 It gives homeowners the ability to blend recognizable forms, such as roof styles and exterior finishes, which may be more appealing to their vision of “home” with daring contemporary elements to create a look that showcases their individual style. Houzz contributor Lisa Frederick describes transitional appeal as having, “...the best of both worlds: You aren’t straying too far from the familiar, but you have the freedom to freshen it as you see fit. And because you can update it indefinitely to reflect current trends, it ages well.” Eschewing the boundaries of exacting design elements, transitional modern becomes a design for living. Modern homes—with their clean lines and minimalist design—have become the archetype of chic sophistication. However, as Chad Eslinger of Eslinger Builders points out, “There isn’t a singular design formula for modern and contemporary homes.” He goes on to describe transitional as a way for people to achieve a cohesive design without being locked into a single aesthetic. Whether it’s adding industrial touches to a traditional farmhouse or blending a soothing color palette of beige, ivory and tan with refined contemporary elements, transitional is a style that is uniquely tailored to the homeowner. Unlike other styles that dictate the home’s details, transitional is guided by the preferences and needs of the homeowner. Although there is significant emphasis on design that showcases the homeowners’ preferences, there are some commonalities among transitional homes and inspiration. With the rise of Houzz, Pinterest, HGTV and other lifestyle-focused media outlets, homeowners are becoming increasingly design savvy. No longer limited by the home designs in the “cookie-cutter” neighborhoods that surround them, 21st homeowners and homebuyers have significantly increased exposure to architecture and design concepts, along with the ability to implement those concepts. One theme among transitional homes is the influence of commercial design—homeowners frequently find inspiration in spas and resort destinations. Lisa Frederick, in an article for Houzz, attributes this interest in tranquil design to homeowners striving for a restful environment. She writes, “You’re going for an air of peace and ease - sure of itself without being brash, calm without being too quiet.” Eslinger echoes this sentiment, pointing out that homeowners want the luxe look of clean, minimalism with timeless accents found in these environments. Phil and Linda Lane recall finding inspiration for their Oregon home, which features a stunning view of Lake Oswego, in a variety of business meeting locations. A recently retired Lexus dealer, Phil was energized by buildings that featured open spaces with clean lines and strong elements of stone, wood, metal and concrete. When it came time to design the exterior and interior of their Lake Oswego home, he wanted to bring those elements into the home in a way that made sense for a residential build. The result was a combination of the Lane’s commercial influences combined with the reality of what was possible from a design standpoint. The home features interior stone, an open steel staircase for an unobstructed view and an interior barn door made of a reclaimed walnut slab with curved colored glass to visually connect with the lake. By allowing the convergence of design and construction – the process – to guide the transitional aesthetic rather than a prescriptive style, homeowners are able to achieve a look that is distinct, yet familiar, and that takes into account their functional and aesthetic needs. This notion of process over strict styling adds another layer to transitional design. It’s not simply about homeowner taste, there is a strong element of design livability. The home not only accommodates the homeowners’ style preferences, it accommodates functionality and livability. This need for a common ground between form and function is apparent in the design of Mark and Sarah Hikel’s Camano Island home. Focusing their design on a spectacular waterfront view framed by a 20-foot-long by 10-foot-high floor-to-ceiling 3-panel sliding glass door, Mark and Sarah wanted to create a home that distilled all of their favorite elements from previous homes into a single design with keen attention to livability. For the interior, the couple incorporated personalized touches, such as higher countertops, sinks and shelf designs to accommodate their height. Pocket doors and large barn doors were installed strategically throughout the home based on their love for the style. A wide hallway gave an immediate view of the water upon entry, while detailed plans ensured that the home received ample light, even on dreary Pacific Northwest days. However, when it came to the home’s exterior and roof designs, Mark and Sarah found themselves searching for solutions that fit both their aesthetic and pragmatic needs. For the exterior siding, metal was initially considered to achieve a contemporary look. However, the couple had warranty concerns, especially with the durability of metal in such close proximity to water. This led them to begin researching siding options that required little maintenance, came with strong warranties and, above all, would maintain their desired aesthetic. Fiber cement siding, given its low-maintenance, durability and variety of looks, became a potential solution. Upon examination of the Nichiha’s concrete-inspired IndustrialBlock, as well as ArchitecturalBlock samples, the couple chose the siding to complement their use of natural stone and add another layer of visual interest to the home. Ultimately, Mark and Sarah found common ground with a low-pitched plantation-style roof that maintained a cohesive aesthetic for the home and provided the height necessary to achieve more interior volume. Visual interest, design that pushed the boundaries of modern and traditional, while still providing a comfortable living experience were all achieved thanks to the Hikels openness to transitional design. While transitional design may be difficult to comprehensively define, that has not slowed interest in it. In fact, Eslinger has homebuyers actively requesting transitional-style homes, rather than waiting for the design formula to present itself. In an era defined by technological advances, access to information and individualism, transitional makes sense. It provides the ability to explore the boundaries of design and express person style, without choosing between form and function. It provides true freedom to design your home to fit your life.